Your Vegas show so much potential, from the delay-ridden piano that opens 'Flybuzz' to the chorus that should be reaching just that little bit higher. Sounding like equal parts U2 and Muse, Your Vegas deal in quite massive, epic sounds. The guitar hooks are riding the wave of the drums, and vocalist Coyle Girelli's voice soars on top of it all during the final of 'Flybuzz'. While I have nothing to say about the competence of the band, they need to progress and mark themselves. The songwriting is a bit rudimentary, and the lyrics are a bit on the banal side of things. Girelli has such a good voice - think Bono, but without the waving of white flags in a contrived message of peace onstage. You end up wishing he'd put his voice to better use at the end of b-side 'Salvadore', the token 'slow song'. At 5 minutes, this is testing my patience. 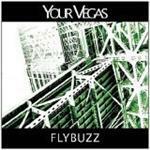 So, in conclusion, Your Vegas need to find their own shoes to stand in, and judging by 'Flybuzz', they are well on their way to doing just that.